So how many of you spent a good part of your weekend searching through the new probates and wills at Ancestry? Were you successful? 1. It contains the married names of females in the family line. 2. It names family members previous research had not identified. 3. It confirms relationships previous research initially uncovered. 4. It lists addresses of individuals in the family line who were among the benefactors. 5. It includes a description and the exact coordinates of the family “ranch” (Since, ironically, we are stationed only a few miles from this place, I can actually go see this property. Pretty excited about that). 6. It delineates which family heirlooms were bequeathed to whom, providing insight into the sentiments of what the family considered valuable. 7. It provides clues to the family’s financial situation in 1927, including their possession of stock (This is an interesting consideration when I remember the speculation of the 1920s leading to the crash of 1929. I can only assume the stocks lost their value just a few years later). 1. Why can’t I find records for any of my Chicago ancestors? With very few exceptions, my ancestors were Chicagoans. Before Chicago, they lived in Europe. As I wrote in a previous post, most of these people possessed very little in terms of material goods, so it is easy to assume this fact alone accounts for this lack of probate records. However, I am beginning to think that the assumption that poor families left no probate records is something of a misnomer. More on this later. 2. It appears that most of the available records on Ancestry date from early years of the 20th century or earlier. Is this a legitimate observation, or am I totally off? If I am correct, why is this the case? 3. Where else should I be looking? Obviously, not every US probate record ever recorded is included in Ancestry’s database. I know the Circuit Court of Cook County has an index I’ve searched in the past with some promising results. I hope to do look ups there next time I am in town. 4. What about privacy laws? Ancestry says they have records dated as recently as 2005. How is it I can easily access a 10 year old probate record, but I have to wait 72 years for the census? 5. I’m not very familiar with the law and legal terminology. What does all this stuff mean and how did the process work? 1. Val Greenwood’s book The Researcher’s Guide to American Genealogy has been on my wishlist for some time now. I am a little embarrassed to admit that I don’t have this mainstay of the genealogy profession on my shelf. . . yet. Now, I am even more anxious to get it. I understand the book dedicates three chapters to probate records. Besides describing the historical context of probate records and who is more likely to have left them, the chapter also provides a wonderful glossary of legal terms common in probate records((1)). 2. Michael Hait presented a webinar for the BCG titled “‘Of Sound Mind and Body’ Using Probate Records in Your Research” last November. A recording of the hour and half long lecture is available for rent for $2.99 through Vimeo. I personally love listening to webinars as a way to improve my genealogy chops. I can often convert the files to an mp3s and listen to them on my ipod when I’m out running instead of trying to find time to sit at the computer and watch them. 3. FamilyTree.com also offers a webinar on probate records taught by Marian Pierre-Louis. Marian Pierre-Louis is one my all-time favorite genealogy lecturers. She has an NPR quality voice and is very clear and easy to follow. At $39.99, the webinar is not cheap, but the phrase, “. . .even poor ancestors may have left behind a probate file chock-full of valuable information” in the webinar’s description piques my interest. Hopefully I’ll have some room in the budget to buy this webinar soon. Well, obviously I have a lot of learning to do! What about you?! Did you find any probate records at Ancestry? Do you have a good probate record resource you would like to share? Let me know! 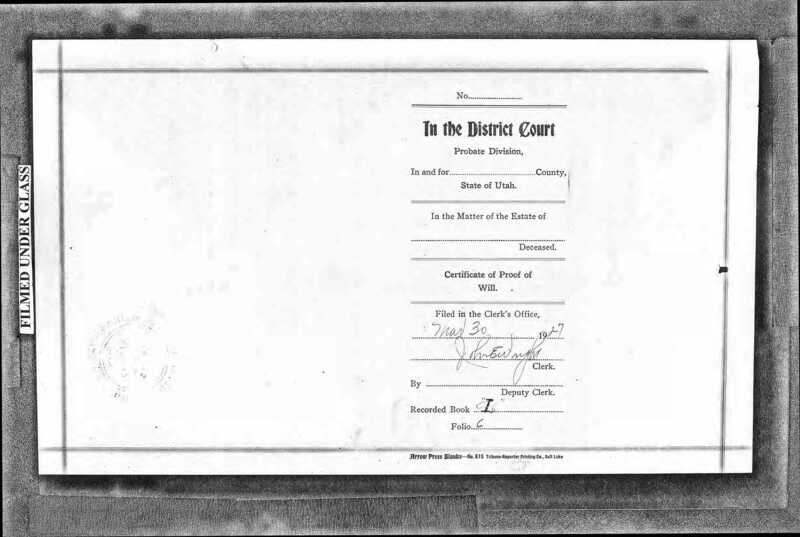 ((1))“Probate Records: Val Greenwood on Probate Records Research Guide,” Beloit Public Library: Stateline Genealogy Club, 11 August 2015 (https://statelinegenealogyclub.wordpress.com/2015/08/28/probate-records/: accessed 9 Septmber 2015).